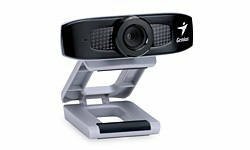 Genius FaceCam 320 is an interesting model, modern and also, creative web camera from a popular brand of Genius. The main advantage of this web camera is certainly support all Windows operating systems, MacOS and Linux. But its technical characteristics are of course want the best. Although what can you require from web camera entry-level. This webcam has a matrix by only 0.3 megapixels. Video resolution is 640 x 480 dpi. Connected to the computer through USB 2.0 port. Built-in microphone she average quality, but for not very demanding user will do. Focusing though the manual, but very comfortable. The sizes of a web camera 74 x 25 x 61 mm, and the weight of its 52 grams.